One of the highlights of directing Transformers is that I get to work with some of our nation’s finest. 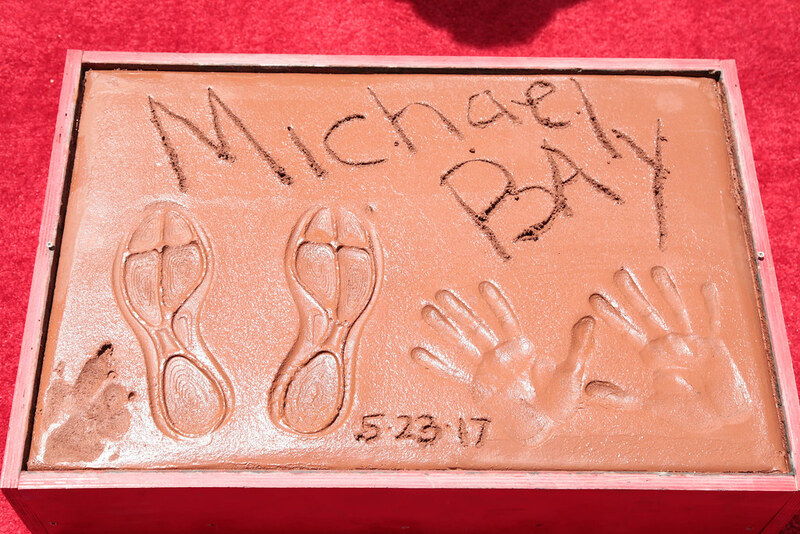 For the record, Bay is a youthful 52, but it’s a credit to his career that his accomplishments over the past 20 years have put him in the ranks of his mentors Steven Spielberg and super producer Jerry Bruckheimer, both of whose imprints are also in the Chinese forecourt. 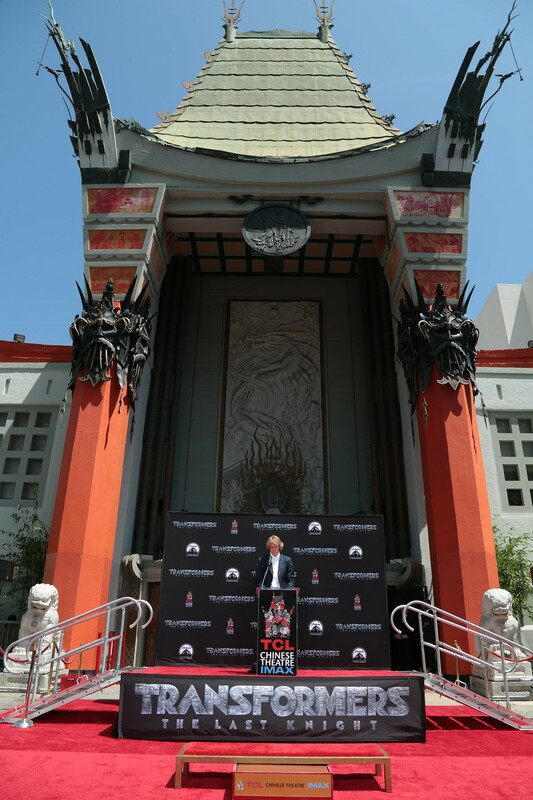 And it’s full circle for Bay, a native Angeleno who discovered he wanted to be a director at that very theater. 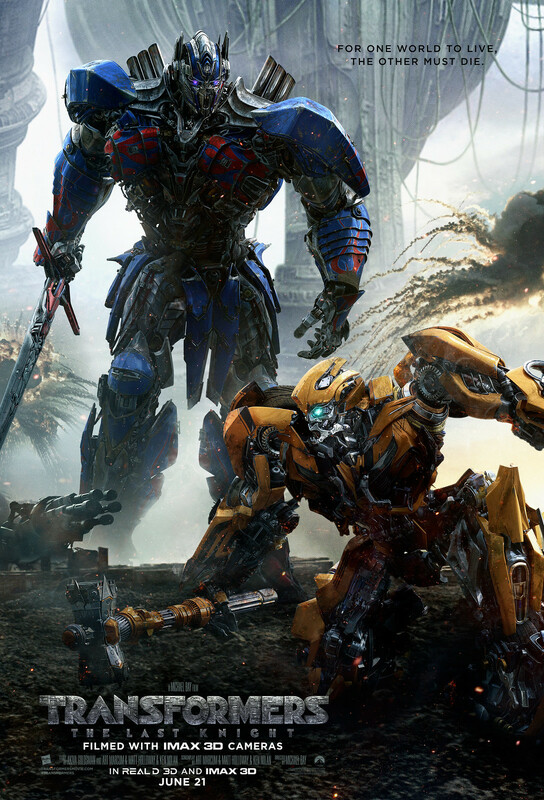 Bay’s rise to the top appears as fast-paced and exciting as, well, a Michael Bay movie. After making a name for himself with commercials and music videos, he was plucked by Bruckheimer and his late partner Don Simpson to make his feature debut with 1995’s “Bad Boys.” Bruckheimer says it was an easy call. “Michael is a true genius as a filmmaker. You could see it very early on, you could see he has a style and a wit, even when it was a 60-second commercial. Unfortunately, we were right and he’s gone on to have an amazing career,” he quips. “Bad Boys” was the first in a line of blockbusters that include “Armageddon,” “The Rock,” and five “Transformers” movies — films that at last count totaled more than $7.8 billion worldwide. 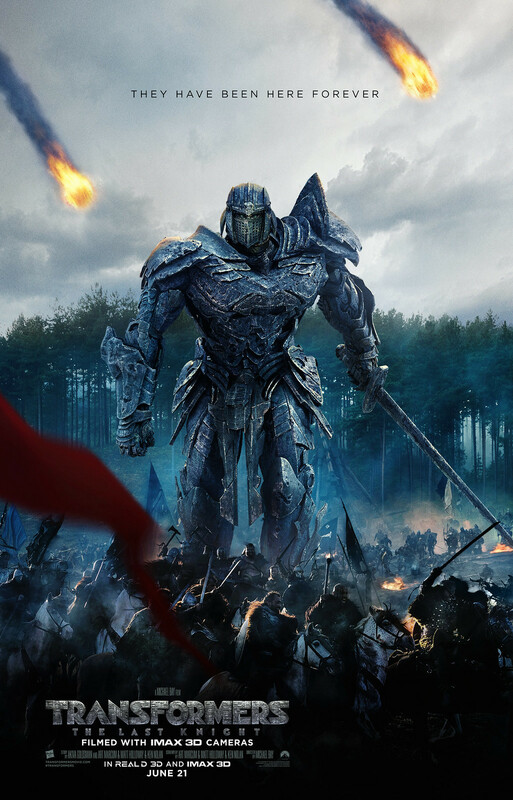 That figure is sure to skyrocket even higher with the June 21 release of “Transformers: The Last Knight.” Then there’s his work as a producer with Platinum Dunes, his company with Brad Fuller and Andrew Form, which has produced a series of hits on smaller budgets and television shows such as “The Last Ship” and the upcoming “Jack Ryan” series for Amazon. Talk to those who know Bay best, and no one is surprised by his meteoric rise to the top. Film historian Jeanine Basinger met Bay when he was 18 years old and a freshman at Wesleyan University, where she was his advisor. Bay came to her with interest in being a film major and showed her some of his photography work. “I was actually quite taken aback that it was the work of a high school kid because it was dynamic, had great compositions and angles, showed a real control and mastery, but the work had life and energy in it,” she recalls. Bay and Jerry Bruckheimer on the set of “Armageddon,” one of their many profitable collaborations. Bay’s signature style is generally associated with kinetic action scenes with rapid editing, and it was there in his debut feature, but not for the reasons one might think. “I got maligned for being such a fast cutter on ‘Bad Boys,’” he says. 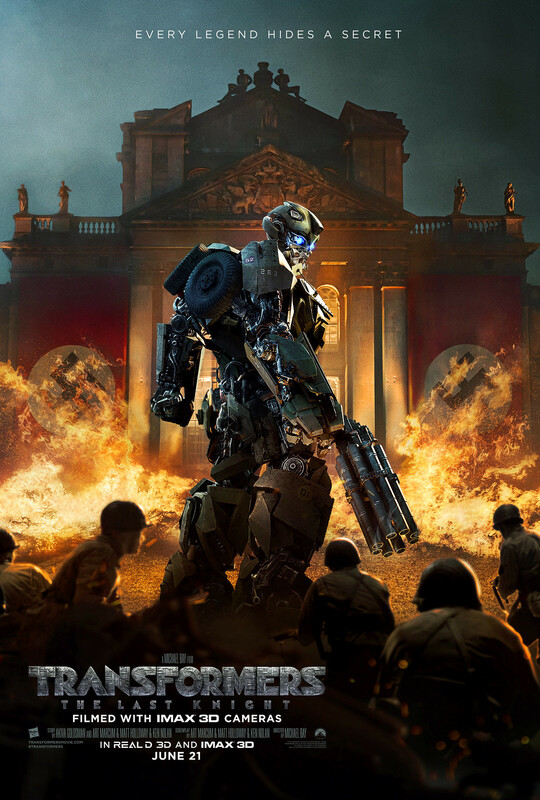 Though it starred Mark Wahlberg and Dwayne Johnson, “Pain and Gain” was made for around $26 million, which probably equals the craft services budget on the “Transformers” movies. 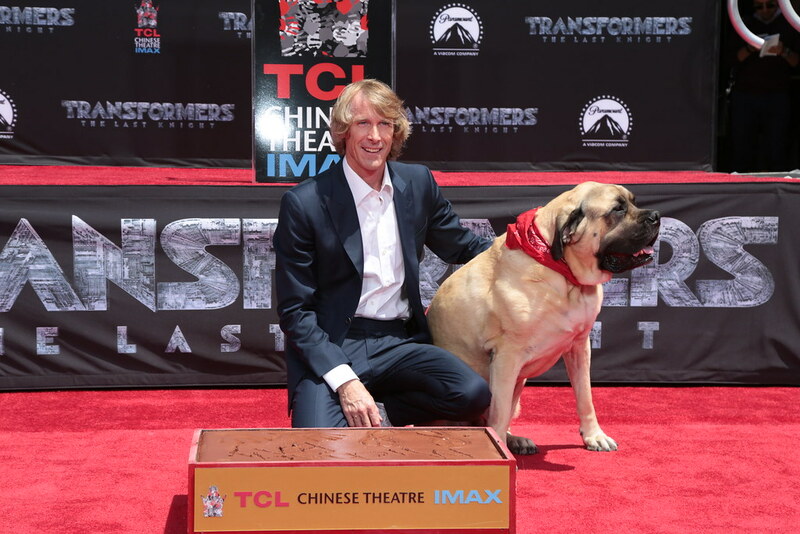 “I was upfront and said I have no idea what kind of movie this is,” he admits. “It’s this bizarre, funny character study of failed people. But I’ve got a great cast and we’ll do it fast like guerrilla filmmaking.” It also happens to be Basinger’s favorite Bay film. “If Preston Sturges were alive today, he would be making ‘Pain and Gain,’” she raves. Michael Bay cast John Krasinski in the lead role of a Navy Seal in the film based on the book by Mitchell Zuckoff. And while he might be dismissed by critics as a popcorn filmmaker, Basinger believes time will tell a different story. They’re never a part of the history books, but they’ve definitely made history.